Director Todd Haynes' dovetailing story of two twelve year olds who exist fifty years apart is sometimes hard to grasp what they have to do with each other. But as the movie progresses, you can't help feel caught up in their stories and ultimately feel satisfied as they gel together in the end. Based on the 2011 juvenile graphic novel Wonderstruck by Brian Selznick who also adapted the novel into a screenplay. Todd Haynes who did the Oscar nominated Carol, has created what may be the most mainstream movie of his work. Oakes Fegley plays Ben who in 1977 lives in Gunflint Lake, Minnesota. The son of a single mother (Michelle Williams), the town librarian, he often asked about this father. She never gets around to telling him when she dies in a car accident. He's now living with his Aunt and her family. One night, going through his mother's stuff, he finds a bookmark in a special book called Wonderstruck which is about being a museum curator. The bookmark is a message to his mom, from whom he presumes to be his father asking her to meet him at a bookstore in New York called Kincaid's. When he attempts to call the bookstore, the phone line is hit by lightening and he loses his hearing. Obviously freaked out, Ben is spurred to head to New York to find the bookstore. In 1927 New Jersey, Rose (Millicent Simmonds, who is actually deaf) lives with her businessman father who throws her book on lip reading. He doesn't have to time and patience to communicate with his daughter. He plans to bring in a special tutor for her. Rose is a fan girl of Lillian Mayhew (Julianne Moore), a stage and silent screen actress. Rose is mesmerized by her, enraptured by her performance which in it's over done pantomime of the medium speaks volumes to her. Rose who fills her room with pictures of Lillian, and paper folded cityscapes, discovers Lillian will be on the stage in New York. She decides to venture to the big city to see her in person. Each timeline is gorgeously dressed to reflect the style and feeling of their eras. The past is shot in black and white, and 1977 is in disco colored city streets. Their stories intersect as the two go seeking their desires. Rose finally meets Lillian who turns out to be her mother. Lillian locks her in her dressing room so she can send her back to New Jersey. So she escapes out the window and searches for her brother Walter who works at the Museum of Natural History. Meanwhile, Ben, who had his wallet stolen, finds the bookstore that is now closed. He can't hear when a young kid tell him that the store has moved. So he follows him to the museum where his father works. Jamie (Jaden Michael) shows Ben his secret closet where he hangs out. There are meaningful coincidences that happen as each child explores the museum culminating in the discovery of the Wonderstuck cabinet of collections. The last chapter resolves those coincidences and if you haven't figured everything out by then, it spells it out. It's a movie for kids afterall so they need to make it clear. 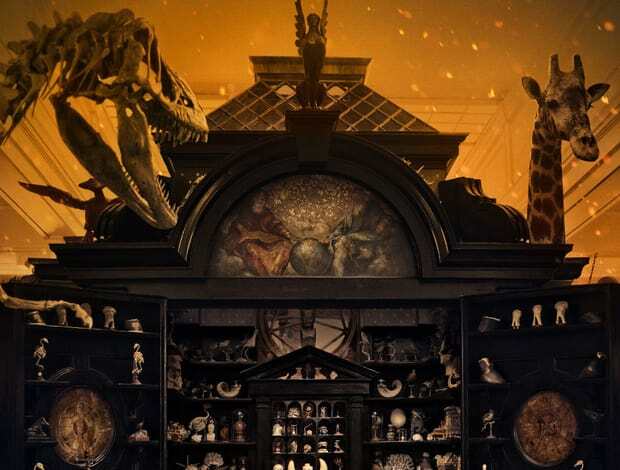 The Wonderstruck cabinet doesn't really figure in the story except being a clue to bring the characters together. The performances are all wonderful, and the movie is a visual delight. The children despite their hearing deficits are not limited in their experiences. But the real star is the museum. And if nothing else it will encourage people to explore the beauty and knowledge offered by these informative institutions.